We have been collaborating with embraceKulture for a few years now on a training and advocacy program for youth with disabilities in Uganda. Today, we are proud to be involved with the opening of their Amaanyi Center, on the property adjacent to our children’s home. I want to share embraceKulture’s incredible story with you, but I think their Executive Director, Christa Preston can do it best. Thanks to the dedication, motivation, and loving compassion of Christa, Kate, Hawa, Naiga, and everyone else involved with this important work, we can do so much more to help Uganda’s most vulnerable citizens. Thank you to everyone who has made this possible. 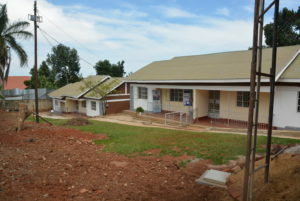 The Amaanyi Center is a first-of-its-kind organization in Uganda, designed specifically for youth with cognitive or developmental disabilities. This is the most vulnerable and marginalized population in Uganda. In the streets they are often call “kasiru,” meaning dumb, or “kateyamba,” meaning helpless. They are five times more likely than their peers to be victims of abuse. Young girls with intellectual disabilities are at the greatest risk, with over 90% reporting incidents of abuse. The Amaanyi Center is working to change this by equipping youth with skills to achieve their potential, stand up for their rights and dream big dreams for their future. The Amaanyi Center was born of a pilot program between Malayaka House and EmbraceKulture, launched in 2017. Through this program, we have been using an apprenticeship model, pairing youth with disabilities and youth from Malyaka House. 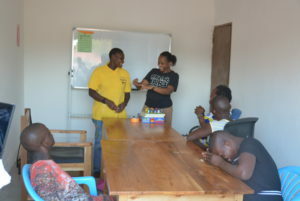 They work together on various income generating programs like Pizza Night, learning important vocational training schools, developing confidence, and earning income. Oliva: You may have heard of our dear Oliva before. 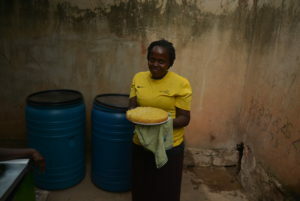 Though she is over 20 years old, Oliva has only received up to a fourth grade education. She never learned reading skills but has excelled at baking and cooking. She dreams to one day work in a restaurant and earn enough to buy a house for herself and her mother. Babiyre and Nkato: The situation was bleak for these twins. As they grew into beautiful young women, their village became a scary, unsafe place. Now at the Center, the girls are constantly laughing, constantly! They both dream of working at a home for young children one day. In just a few days, it has been incredible to watch their personalities grow and change. Maureen: This remarkable girl survived an incredible tragedy when she lost her parents and her twin sister. But she never lets anything get her down. Maureen dreams of becoming a lawyer one day and, let me tell you, this girl knows how to argue! Mary: Our dear Mary is at the center as well. She is learning not only job skills but management and entrepreneurship so she can one day lead her own business.